Background: Diving accidents are catastrophic events frequently causing spinal high level tetraplegia, mostly in active adolescents or young adults. Many papers have been dedicated to the epidemiology, trauma mechanism, and prevention of these events, yet the effect of upper extremity surgery in this specific population has not been adequately studied previously. Recently, we investigated the clinical improvement and subjective patient satisfaction after upper extremity surgery to improve arm and hand function in high-level tetraplegia after diving accidents. Study design: Between the years 2000 and 2009, a total of 28 patients with a mean age of 24.7 years (range: 17 to 37 years) underwent surgery to restore upper extremity function lost at a mean 4.6 years earlier due to cervical spinal cord injury caused by a diving accident. Functional parameters, such as key pinch, grasp strength and active thumb-index opening were measured prospectively. 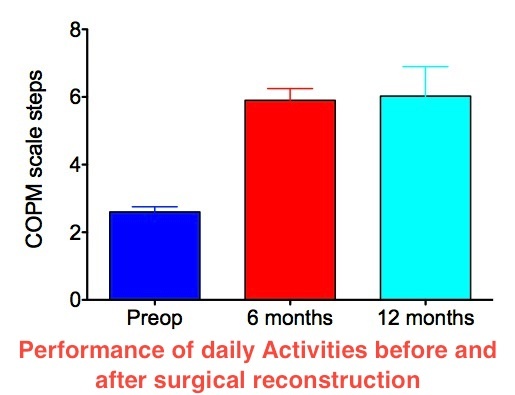 Results: Upper extremity reconstruction included a mean of 2.6 (max: 5) stages. Overall, 21 patients underwent restoration of elbow extension, 24 had a key pinch reconstruction (6 passive, 18 active with active finger grasp), 7 had restoration of active finger extension combined with their thumb extension or abduction, passive finger extension were performed in 3 and a thumb stabilization procedure in 19 patients. Outcome of surgery measured according to Canadian Occupational Performance Measure (COPM) did not differ compared to results of reconstruction after other caus es of tetraplegia (traffic accidents, fall, sports and violence). Conclusions: Operations using tendon transposition and joint stabilizations have a great potential to improve arm and hand function and thus independence and mobility in tetraplegic patients, even when suffering from high-level SCI due to diving accidents.